As part of the Missionary Independent Spiritual Church movement, the Santeria Church of the Orishas knows the efficacy and power of a simply prayer said over a blessed and dressed candle. 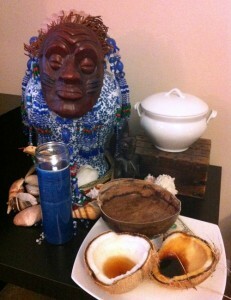 We regularly light candles with prayers and petitions for those seeking to ask the orishas for assistance. We dress our candles with Dr. E. Products‘ hoodoo condition oils, herbs, then prayed over with a traditional Lukumí prayer. The person’s petitions are read before the Orisha’s sacred vessel and the lights are set to burn at their shrines. When the candles are finished burning it is traditional to email the petitioner a report of how the candle burned as a sign from the orishas regarding their petition. This is a standard service that members of our church offer to the public for a nominal fee. If you’d like lights set at our shrines, contact Rev. Dr. E. at ConjureDoctor.com for his Setting of Lights Service. As an extension of our church’s efforts to help the community, we participate in The Crystal Silence League. The Crystal Silence League is a free prayers service orchestrated by the Missionary Independent Spiritual Church members, where prayers and petitions of those seeking assistance are prayed over at sunrise and sunset. The focus of our Crystal Silence League‘s prayer service is our crystal ball placed at our spiritualist shrine. We place petitions under the crystal ball and recite prayers to assist those who submitted their petitions at sunrise and sunset. As the world turns, and the sun rises and sets around the planet, our network of Crystal Silence League members around the world keep those prayers going in perpetuity. To submit your prayer request, visit the Crystal Silence League website.